It was one of those moments I had always envisioned. Training wheels come off. Ready. Set. GOOOOOOOO - and off she would ride. Ahhhhh, well.... it didn't quiet go down as dreamed. We were up at Daniel Webster on Saturday working on the mural, Charlie was running around enjoying his freedom on the playground while Maggie got to grout the new mural. Maggie soon lost interest in her arts project and headed down to the lower playground to play soccer. I walked her down & knew she was enclosed and happy to be playing with her classmates. Charlie and I ventured off to enjoy some lunch and dance to the live band. Time passed a bit...and so it was time to check on Mz Maggie. We walked over to the fence that looked down on the lower playground and my knees buckled... there was Maggie, helmet on & riding her friends Elvis' bike. WHHHHAAAAT! WAIT. MAGGGGGIE!!! Perfectly riding around - pedaling, turning & just chatting with her buddies. Instant PRO! I just started to tear up. There was my Maggie. RIDING A BIKE! Amazing. And while not how I had dreamed - it was perfect. 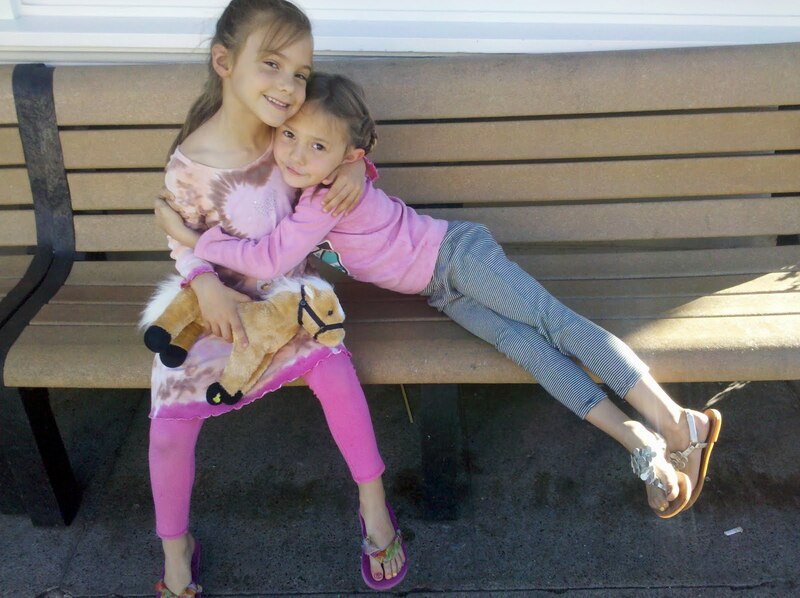 With Halloween the night before and the holidays on the horizon...a play date was a must as Maggie relaxed on her first public school furlough day. We tossed the windows open on an incredibly beautiful fall, crisp day - let the sunshine in and invited Maggie's new friend from school, Mz Caroline, over for some good ole fashion fun. I dialed up my domestic self by making a delicious seasonal slow cooking stew, planting flowers, and cleaning out drawers. Maggie and Caroline did what they do best, giggled their way through all sorts of adventures in the backyard. 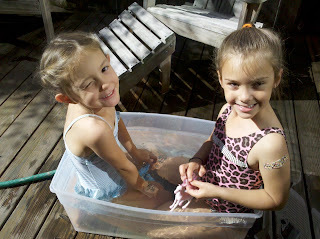 From 'swimming' to climbing trees to sneaking in the playhouse with the Halloween bucket - they had a grand day. And you know what, so did I!!! 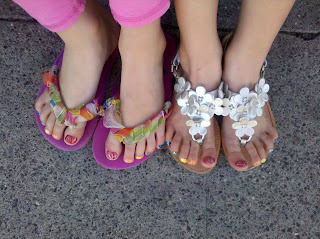 But of course, what better way to end a lovely play date but with some RAINBOW SPARKLY toes. They were glowing as they marched home. Ahhhh. to be 5.